I can't find anything good to say, nor bad to say. This is one of the many Judo books that are adequate, but not interesting enough for the advanced Judoka. This would be a fine book for the beginner to own, especially in Britain, as the book is somewhat British oriented. The book is organized by belt color, giving the techniques needed for each rank. Many B/W photos are scattered throughout the book, but all are posed, and are not inspiring. The need is very real for a book covering all known judo techniques and the major variations, written to take the reader progressively from novice to 3rd Dan. While there are several good judo books on the market a complete textbook, well illustrated and, I trust, authoritative, will serve to guide the judoka throughout his judo life. When any judo book is published there is always a discussion on the relative merits of using Japanese and English terminology. My own opinion is that, for the lower grades at least, it is quite hard enough to learn judo without having to learn Japanese; however, as I quite appreciate there are other schools of thought, both Japanese and English terms are given side by side. No one can say with absolute certainty when ju-jutsu originated. Certainly it was developed by the Japanese, but I am inclined to the view that various ju-jutsu methods were originally introduced to Japan by the Chinese, as indeed were many things. 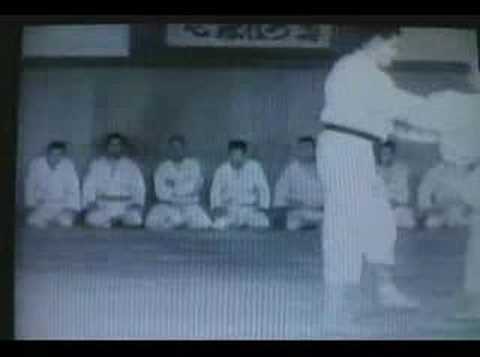 There is no doubt that these original forms of unarmed combat were expanded and improved by the Japanese; teachers of jujutsu evolved their own systems and sundry techniques were taught by them. While certain basic methods were common to several schools or teachers, it is doubtful whether any one teacher would have a comprehensive knowledge approaching that of a good judo coach today. We have to remember that ju-jutsu was taught, not as a sport, but as a method of fighting to overcome or even kill an opponent. Techniques taught by the various teachers were often passed on under oaths of secrecy, and the ju-jutsu masters did all they could to ensure that their art did not become common knowledge. When the feudal system came to an end during the nineteenth century, ju-jutsu lost a great deal of the popularity it had hitherto enjoyed. The foundation of a strong central government with a police force and army based on western lines meant that the old concept of the individual warrior class (the samurai) was outmoded, and in consequence teachers of ju-jutsu, archery and swordsmanship found themselves without many pupils. 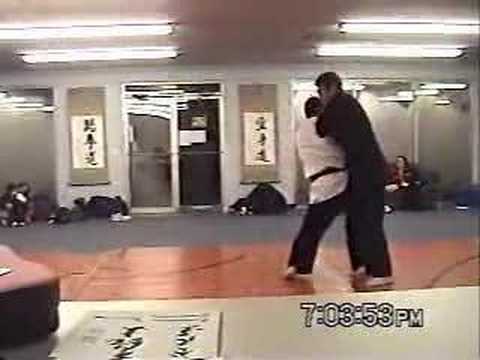 Fortunately for us, while many ju-jutsu teachers were concerned at their lack of pupils, one man saw in certain ju-jutsu techniques the possibility of a popular sport being developed. Jigoro Kano, the founder of judo as we know it today, started his club, the Kodokan, at Tokyo in 1882. He developed and adapted many of the ju-jutsu tricks and methods and, over a period of years, improving his system constantly, proved that the Kano judo was superior to ju-jutsu in contest. Many of the ju-jutsu men recognized the advantage that judo could offer and the sport became firmly established, until today the Kodokan in Tokyo is more than a mere club: it is a very large modern building with seven dojos (exercise halls), the largest having 500 mats each six feet by three feet, it stands six stories high, has a large cafeteria, a library and even bedrooms for foreign students who study at the Kodokan. As far as Britain is concerned the first exponents of the then new Japanese art were Yukio Tani, who came in 1899, followed by Uyenishi in 1900. While Tani toured the music halls taking on all comers, Uyenishi founded one of the first schools in London at 31 Golden Square. This was, Uyenishi claimed, 'The original School of Ju-jutsu in England'. Britain showed a keen interest in the Japanese visitors and several advertisements were placed in the physical culture magazines of the day. Uyenishi is titled 'Prof. S. K. Uyenishi-Ju-jutsu champion of the world', and the advertisement stated: 'The art can be learnt in a few lessons.' The Ashikaga School at 7 Electric Buildings, Liverpool, not only offered to teach by post but also assured all that the system is a positive cure for constipation, dyspepsia. insomnia' and, among other things, 'loss of vitality'! In 1905 advertisements announced that the Anglo-Japanese Institute at 3 Vernon Place, W.C., taught ju-jutsu, with postal tuition for country readers; an unknown person advertised from 528 West Green Road, London, as did another 'Prof.' from Stanhope Gardens, Harringay, who claimed '15 years' experience'. Apart from the establishment at Golden Square, the only other major school to my knowledge was 'The Japanese School of Ju-jutsu', 305 Oxford Street. Here the mat area is given as 1,050 square feet in the main dojo. The principal was Taro Miyake assisted by two fellow Japanese, Eida and Kanaya. Before coming to Britain, Miyake obtained a certificate as champion of judo which was presented by Kano, and a sword of honour given by Prince Komatsu, then President of the Butokukai. In 1904 Miyake defeated Tani in public competition, which caused a considerable stir at the time in the British press and sporting circles, as it was thought Tani was invincible. Nineteen hundred and six saw the entry into Britain of the man who has done most to keep the flame of judo alive-G. Koizumi. He first took employment with the Ashikaga School of Ju-jutsu but left after the owner asked him to perform on the music halls in the Tani fashion. G.K., as he is affectionately known, left Britain for the U.S.A. in 1907 but returned in 1910. The Budokwai was founded in 1918 by 0.K., who was then hon. secretary, Tani being the instructor. Through many difficulties the Budokwai kept going and still remains with us today. Between the wars judo in Britain was certainly not a popular sport-indeed it was regarded as a rather mysterious subject- and it was not until 1948 that judo really started to make an impact upon the majority of the public. A decade later judo became quite an everyday word and people knew what you meant when you mentioned your sport. Even in 1948 if you told people you practised judo you normally had to explain what it was all about and you stood quite a good chance of being regarded as a crank. Now in 1963 there are about 1,000 judo clubs in Britain, 90 per cent of which are affiliated to one of the two major associations, the Amateur Judo Association and the British Judo Association; at the time of writing the associations are of about equal size. Judo as a major sport in Britain is still very young, and no doubt we shall see many changes over the next few years. In 1902 the United States had the benefit of one of Kano's best instructors, Yamashita, who had the distinction of teaching no less than the President, Theodore Roosevelt, who practiced at the White House for a period of three years and gained a brown belt. The oldest club in the States is the Seattle Club which was founded in 1903. Between the two world wars a very large number of Japanese entered the U.S.A. and settled; judo clubs were formed but many were for Japanese only, and it was not until after the end of the second world war that judo became popular. Many U.S. servicemen studied judo in Japan and wished to continue their sport when they returned home. It is estimated that there are some 550 active clubs in the U.S.A. and the number is increasing weekly. Europe has taken to judo, with France and Italy each having a large number of clubs, although before the last war Germany had several clubs and regular matches used to take place between British and German teams. In France a high-ranking Dan-grade will quite often open a club and invite the public to join, the club being in fact a professional school. While the fees tend to be higher than those of an amateur club it must be appreciated that the facilities offered are frequently far better than those which an ordinary club can supply. Perhaps one of the best-known of Japanese instructors in France is Mikonosuke Kawaishi, 7th Dan, who became Technical Director of the French Federation of Judo. 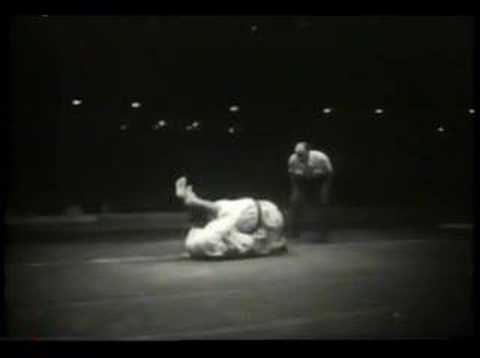 So much has judo progressed in Europe that, on 2nd December 1961, a Dutchman, Anton Geesink, became the first European to win the world judo championship by beating Koji Sone of Japan. Few people thought that the standard of judo in Europe would reach this level but, in the not too far distant future, it may well be that we shall see a greater general improvement in the techniques used. It is reckoned that there are altogether 5,300,000 judoka attending 25,000 clubs throughout the world, Japan having four-fifths of both judoka and clubs. This does not take into account the large number of people who are interested in the sport and practise privately or even at some of the small un-affiliated clubs; no figures are available for these groups. 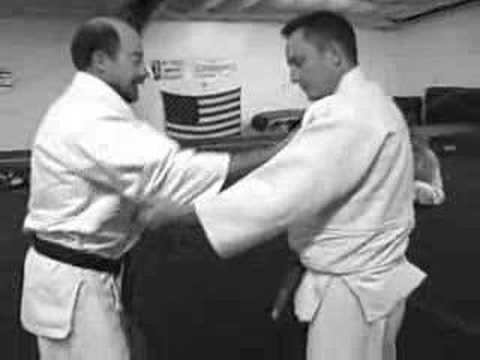 You will note that as the judoka rises from his first belt, 6th Kyu-White Belt, the shade of his belt darkens until he reaches 1st Kyu-Brown Belt. This has the very practical advantage that when a person is graded he may dye his belt to the colour of his new grade. Strictly speaking, a novice should not wear a white belt and, indeed, some clubs insist on a red belt being worn by their pupils. 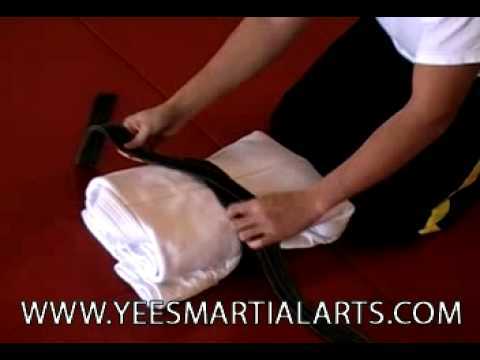 Normally, though, the ungraded judoka is allowed to wear a white belt so that he does not have to go to the expense of purchasing a new belt when he is graded. Great stress in judo is laid on circular movement and, as you will see from the various coloured belts listed, a judoka starts with a red belt, so that if he completes his judo knowledge he ultimately acquires another red belt, 10th Dan, thus completing the circle. The chances of ever reaching this rank are slight; at the time of writing I know of only three 10th Dans, all Japanese. 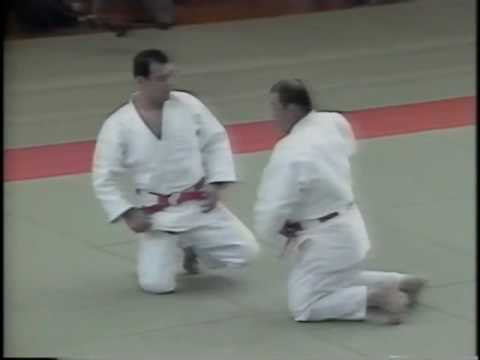 The highest grade held by an Englishman is 6th Dan by Trevor Leggett. There are variations in belts for juniors and details of these are given in Appendices One and Two at the end of the book. Judo means 'gentle way' which, if you have seen many contests, seems at first sight to be a misnomer. The principle underlying judo is maximum efficiency in application of mind and body. A stronger opponent than yourself can be overcome by skill and by using the maximum efficiency; the difficulty lies in achieving this greatest point of competency and presumably the 10th Dan holders have progressed to this stage. Strength can, quite obviously, only be used against resistance; if you do not resist your opponent then his strength is of little use to him. To illustrate what I mean let us assume someone is pushing me by placing his hand upon my chest. If I stand still and lean my weight against him then, should I be as strong as him, nothing will happen. If the person is stronger than me he will succeed in pushing me back. Now suppose that instead of resisting the push I only resist for a fraction of a second (to encourage my opponent to push even harder) and then suddenly step backwards, my opponent will lose his balance and stumble forwards. By applying force to a resistance that is suddenly removed my opponent loses his balance and his strength at that moment is nullified; in fact he can no longer use it. It may well be said that with judo we can fight strength with skill; the difficulty lies in acquiring the required amount of skill to make a competent judoka. Frequently a throw is demonstrated to a class and an instructor then asks his pupils to carry out the movement shown; often the movements are not carried out very well and the instructor goes round correcting the various pairs to the best of his ability. The main trouble one faces in teaching is that, while a pupil will do his very best to carry out the techniques shown he will not always give sufficient time and study to the elementary principles upon which judo is based. An understanding of the principles of leverage, some study of anatomy and a real attempt to master the various ways of breaking your opponent's balance are essential if you are to hope for progress. Many people who join a judo club start with good intentions but stop attending after a few weeks. Some might well say that this could be due to lack of ability in the instructor as he was unable to inspire his pupils with enough enthusiasm, but this happens even in the best of classes at leading clubs. A very great deal depends on the mental attitude of the student; you must be prepared to study the subject seriously and give a little thought to what you are learning. Merely learning how to fall, followed by a few throws, hold-downs and locks cannot turn you into a good judoka unless you are prepared to study the theory behind each movement. If you find a certain technique does not work, do not assume that you have been taught incorrectly; rather find out where you are going wrong in the movement and then try again. Perfection is something we all strive after but rarely achieve; do not expect a throw you have recently learnt to be effective in contest against someone of your own standard every time you attempt it, indeed if you are able to execute the throw once every six or seven attempts against resistance or counter-movement you are doing well. As you become more experienced the number of times a technique can be applied with effect will increase, but do bear in mind that while you are progressing your partner, if he joined at the same time as you, will also be improving. If you are prepared to work at judo under a competent instructor you will, with hard practice and study, progress. 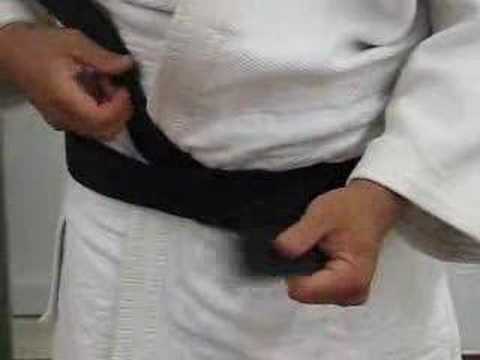 I know of people who have obtained a Black Belt in as little as two years' intensive-I mean intensive (six nights a week, Sunday afternoons, vacation courses) -- study; six or seven years is nearer the average, although many can never hope to obtain this distinction as they are just not prepared to put enough effort into the sport and many others fall by the wayside. I fully appreciate that there are many people who have no particular desire to obtain a high grade at judo and are quite content to practise for the exercise they obtain; indeed, this (I feel) is a very good attitude if all you want is to keep fit. While many start off with this intention some find themselves possessed by a driving force which makes them want to really know their subject. If you have any doubts about which class you belong to then six months of judo practise will show you! To many judo has a fascination all of its own which no other sport can provide. Please do not think that I advocate 'belt hunting' just to see how many belts you can collect in the shortest possible time, but as your ability and knowledge improve progress will be made and this will be rejected at gradings. There comes a time during everyone's judo life when you feel that you are making no progress at all and, in fact, it seems you are worse than you were several months ago. Funny as it may seem, this is often a sign that you are starting to appreciate a little of the true art of judo; your critical ability is such that you can see your faults and shortcomings. An eminent judoka who once coached me used to say that as your experience in judo widens you realize just how little you really know and, when this happens, you start to make true progress. At the time I felt that this was undue modesty on the part of my mentor, but now I know just how true this statement was. After a person has learnt judo for twelve weeks he is often quite prepared to give all kinds of definite advice and make dogmatic statements-after twelve years of study he is normally far more cautious. A great deal is said and written about mental attitude in judo; please do not get the idea that this means you should devote yourself to many hours of contemplation or many years' study of Zen. What is important is your mental attitude to judo and your fellow judoka while you are practising the sport. The mind controls the body, you must control the mind; it sounds easy if you say it quickly but the whole matter requires most careful study. First of all, each of us has a fear of falling which is instinctive and must consequently be overcome. Once you have a good working knowledge of breakfalling you need have no fear of harming yourself on a judo mat when being thrown. I know this is a very elementary point but it is one which cannot be stressed too frequently; here, indeed, is a good example of mind over body, for the mind has convinced the body that a fall can be made without injury. What you are really doing is learning by experience, for although you may tell yourself that you will not hurt yourself when you fall, until you have succeeded in completing a number of falls without doing so you will not be convinced. Once the mind accepts the fact that a fall can be made without damage then the mind controls the body as far as falling is concerned. The trouble comes when you are asked to accept statements which do not seem to be correct; if, for example, we go back to our illustration of strength being nullified when resistance is removed then, particularly if the lecture is illustrated, the mind will accept the statement without further ado. Should, however, an instructor merely say 'If you use strength instead of skill to throw a person then your judo progress will suffer', this is much harder for the mind to accept. 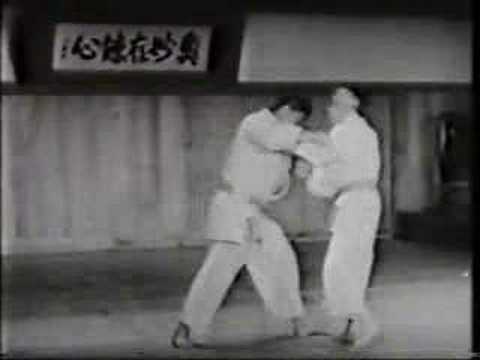 You know that if you have a weaker opponent you may be able to throw him or force him to the ground with a lot of strength even if the technique that you use is not very good. Your mind, therefore, may not be prepared to accept this statement-not, that is, until you have studied the reason. It is essential to have the sort of mind that questions initial reactions and seeks explanations. If you have the right mental attitude to judo you will use skill instead of strength, as the time will come when you will meet an opponent whom your strength will not be sufficient to overcome. If you have relied on your power and found that it worked up to, say, yellow or orange belt, you will find that the brute force is no longer working so well on judoka who started at the same time as yourself but have absorbed the principles of judo correctly. We return to the adage of maximum efficiency of mind and body. Please do not think from what I have said that strength does not play a part in judo-it certainly has a proper place in implementing your chosen technique-but do not let it rule you; let your mind be the main factor and apply it while you are learning judo. Mind over matter indeed. Judo certainly has a positive effect on the mind; it makes you a fuller person, helps you to control immediate reactions and can give a calm and peace of mind which many people find very difficult to obtain these days. If you intend to make a serious study of judo you will certainly appreciate the need for personal fitness. There are many who will tell you that the best exercise for judo is judo-quite good advice, but by no means the real answer. You will find in the next chapter a section dealing with judo exercises which I commend to you; these are certainly useful but I would advise that you consider weight training or at least resistance exercises. Many of the leading judoka train on weights and special attention is given to the leg muscles. A suitable book that I have used to advantage myself is Modern Bodybuilding by Oscar Heidenstam, editor of Health dc Strength. It is published by Faber & Faber at 12s. 6d. Do not fear that weight training will over-develop you; keep to the exercises listed for strength rather than those to build up your body-unless, of course, this is what you require. There is no reason why increased strength should be gained at the expense of speed of movement. It is still possible to move quickly-if you are fit. I know that the large man is associated with sloth, but this need not be so; some of the best judoka I see are large but still quick, and a lot depends of kinetics, as we shall see later on. Diet, smoking, drink and sexual relationships all come into any discussion of fitness and maximum efficiency. Over-eating or excess in any of these will hardly help to keep you fit or at your peak. Do remember though that there are very few cranks among judoka and I know far more judoka who smoke than do not. If you are training hard obviously you will eat more-you need extra food to replace lost energy. Too much starchy food, such as cakes, bread, potatoes and the like, do tend to put on unwanted weight, while meat, eggs, cheese, fresh fruit and vegetables give you all the essential foods you require. Athletes do tend to eat a great deal of meat and certain dietitians feel that this is not essential-not essential in the quite large quantities that are tucked away. I think an athlete in training should consume about 4,500 calories a day: one pound of steak gives 1,090 calories and a high protein content of 18 6 per cent, while one pound of bread gives 1,180 calories (9 per cent more than the steak) but only 9 2 per cent protein. Both steak and bread are of course needed and a balanced diet is essential for a fit body. If you are concerned about your food intake there are several very good books on simple dietetics that can be consulted. For the very peak of physical perfection smoking should be avoided, but for the average judoka not a great deal of harm will be felt from moderate smoking. Drinking in moderation is not, I think, harmful, and I am not aware that bachelors are better judoka than married men. Having stated the importance of fitness in mind and body I feel it is necessary to show how a study of elementary kinetics will be of great help to the judoka. If you can stick with me for a page or two and make a real effort to understand a few basic principles relating to the way our bodies and thought processes work it will be extremely useful. Normal retaining of balance is mainly quite an unconscious effort; the majority of the many muscular adjustments that we make are automatic. The cerebellum (or 'little brain') situated below the brain proper consists of nervous tissue and acts as the operations room for the body as far as balance is concerned. Messages are carried from the muscles and joints by sensory nerves, which give information to the cerebellum regarding the positioning of limbs; in turn, replies are transmitted which order the body to make adjustments to cope with the situation. The whole process is not unlike that of an electric computer: data are fed in, acted upon and the solution given. Sometimes the cerebellum is unable to cope with a major disturbance of balance and the message goes through to the sensory cortex, centre of the nervous system. If this happens we become consciously aware of our loss of balance; the action then taken is 'thought out', even if the process takes only a fraction of a second. What normally happens is that a message travels from the sensory nerve fibres, which are just under the skin, to the sensory cortex. The message reaches the brain and an order is issued via the cells of the motor cortex, is transmitted to the motor nerves and is taken by them to the appropriate anterior horn via the spinal cord, thence along an axon to the muscle. On occasions the process just described is short-circuited and this happens when a reflex action occurs. The sensory nerve starts to send a message back to the brain but, at the spinal cord, it takes a short cut through to the motor nerve which passes information direct to a muscle which contracts. This is called the reflex arc. When you have made some progress in judo you will find that certain changes in balance and movement take place as unconscious actions; actions which hitherto you have had to consider are automatic. The frequency of reflex actions will increase with the amount of practice that you do. While a very great amount of work has been done in industry in the field of work study, not a great many judoka take enough trouble to apply these principles to judo. 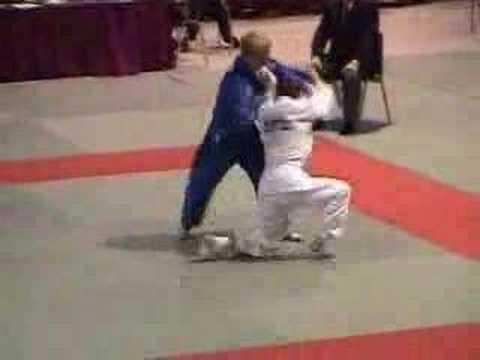 You will recall that the basic principle of judo is maximum efficiency with minimum effort. The equivalent of work study in judo is the physical mechanics and kinetics of the body that can give you a true insight into the real meaning of 'the gentle way'. All body movement is controlled by the alignment and relationship of the various bones and joints forming the human skeleton. These are controlled by individual or collective muscular actions, the primary functions of which are to provide the stability and mobility of the body. The human body has a high centre of gravity, most of the bodyweight being concentrated in the trunk, upper limbs and head; consequently it tends to collapse under the influence of gravity. 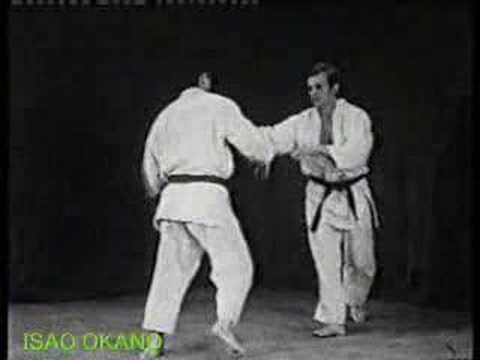 The manner in which this occurs has the most important influence on all judo actions. When the feet are placed together the body has a small and unstable base, which without the controlling actions of the muscular chain and the locking action of the joints would be easily disturbed. Every time the balance of the body is altered, correction must be made by counter-balancing. If, for example, the judoka steps forward on to his left foot, he is throwing his centre of gravity out of line and is off balance until he takes up and increases the pressure on the mat with his left foot. When you walk, you will notice that, on a forward move-ment, the foremost heel instantly takes up the pressure downwards, allowing the rear foot to swing forward and take up position. The two heels, when walking, never touch the ground simultaneously so your bodyweight is continually being redistributed from one leg to the other. 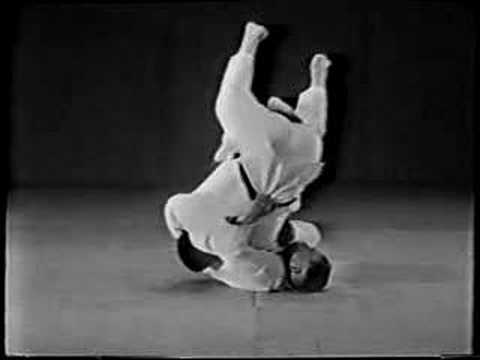 Any attempt to cover the whole field of body mechanics and kinetics and apply them to judo would take up a very great deal more space; however, in the practical application of each technique given in this book the description is based upon the principles shown in these last few paragraphs. While the weight of the body is controlled by the combination of movement and balance, it must be appreciated that this, in itself, is not enough; maximum effect can only be obtained when the various actions are co-ordinated and true balance maintained. Add to this the speed of the judoka's reflex actions plus, of course, the degree of skill that has been acquired. 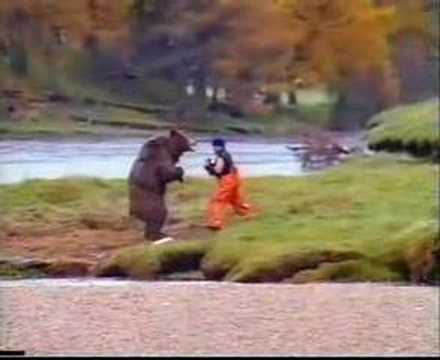 Let us now turn our attention to the actual learning of judo. Dirty Belts... The Myth...The Facts! Do You Want To Improve Your Judo?